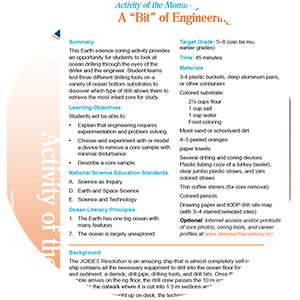 Actvity Summary: This Earth science coring activity provides an opportunity for students to look at ocean drilling through the eyes of the driller and the engineer. Student teams test three different drilling tools on a variety of ocean bottom substrates to discover which type of drill allows them to retrieve the most intact core for study. After the core is brought up on deck, the technicians notify the rest of the crew by yelling, “CORE ON DECK!” Technicians handle the core very carefully so they do not disrupt the contents. Finally, the cylindrical core sections are cut in half lengthwise so that lab techs and scientists can take samples and write descriptions of the contents in hopes of discovering new information. But who brings the core from the sea floor to the deck and who figures out how to drill? Drillers, drilling technicians, and engineers.